Toolbar 7 is more streamlined, cleaner and simpler to use all while showcasing what is most important to you. As you use tools within the toolbar they will automatically appear on the toolbar making your experience much easier to customize and navigate. Now with the new Google Toolbar you can control your privacy settings as tools such as PageRank and Spell Check require you to share information with Google. 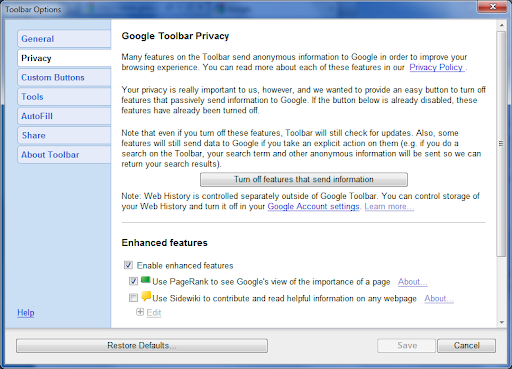 If you do not want Google to have some of that information you simply need to go to the toolbar’s privacy settings and turn off what you want.